Could you help unpack the claim that New Deal programs extended the Great Depression? Naturally, it’s something that keeps coming up in debate when discussing the extension of government programs, especially in the current climate, but what exactly the argument is isn’t something I’ve truly understood. On the one hand, I’d be more than willing to believe it as partisan rewriting of history, but the same people making the claim seem to credit World War II for ending the depression, which, let’s face it, was the biggest public works project in history (though, admittedly, it isn’t usually characterized as such). Is there any real basis here? If so, what are the lessons we need to learn? If not, what is the best way to argue against such claims? Your instincts are right— the New Deal is a huge problem for libertarians, and popular besides, so they have to engage in a good deal of revisionism to discredit it. Under Hoover, no new Deal: declining GDP. 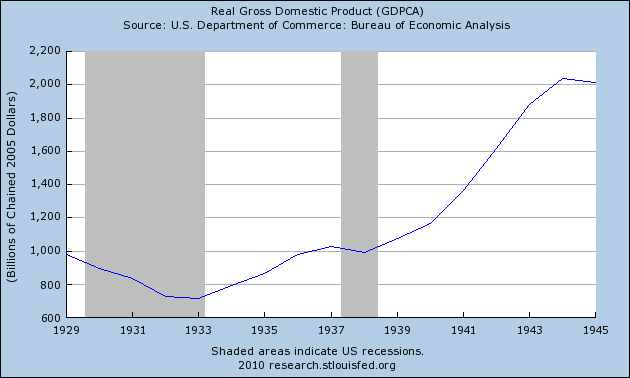 Under Roosevelt and the New Deal: GDP recovers, nearly doubling in the pre-war years. Stopping the stimulus early sent the economy back into a recession (with a lag), and was cured by restoring spending. 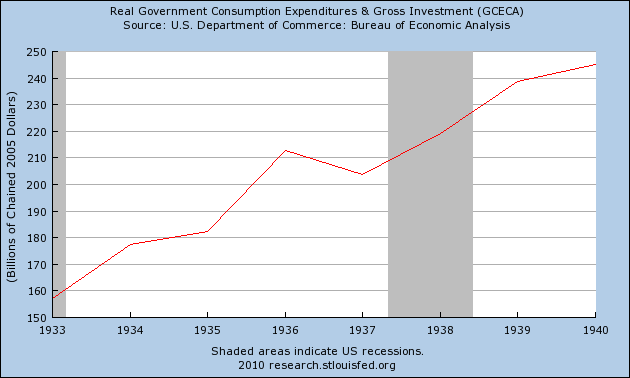 The New Deal stimulus was working, but you’re quite right that what really ended the Depression was WWII spending. Many people seem to react to this as if it the war suddenly removed the discussion from economics: oh, you know, that was a war. It sure was; it was also, as you say, an enormous public works project. It was so huge that I had to remove the war years from the above graph: expenditures were eight times higher, so the 1937 blip gets washed out. Let me underline that: the war worked better as stimulus because it was eight times larger. And as government spending, a war mainly involves throwing money into economically useless things: bombs, guns, tanks, aircraft carriers. Imagine spending all that money on useful investments instead. The fourth link in particular gives more detail on the source of the “New Deal was bad” revisionism.